You have to hand it to Marvel, they do have 'Comic's Greatest Marketing Team' - and have had even before they were acquired by the House of Mouse. When it came to shining a light on upcoming Spider-Man mega-arc Ends Of The Earth, the crew rounded up the been gone far to long, mad paint skills of artist Gabriele Dell'Otto, and got him rendering Pete going head to head with each member of the storyline's newly reformed Sinister Six. A team built to highlight the coolest Rouges gallery in comics (sorry Bats), these teaser posters of Doctor Octopus's new five best buddies may show the familiar faces have undergone a few wardrobe changes since the days of their classic duds, but as long as Mysterio's bowl and cape remain fairly untouched, I'm still one happy camper. Wouldn't Doc Ock do the Sinister Nine? You know, a henchmen for each arm of the octopus and himself as the head? Add Vulture and Kraven... Or maybe mad scientists just love alliteration more than ego. Either way, this storyline promises to prove why the wickedly good Doctor is still Spidey's biggest bad, having recently fought and in somecases beaten the likes of Iron Man and Reed Richards! 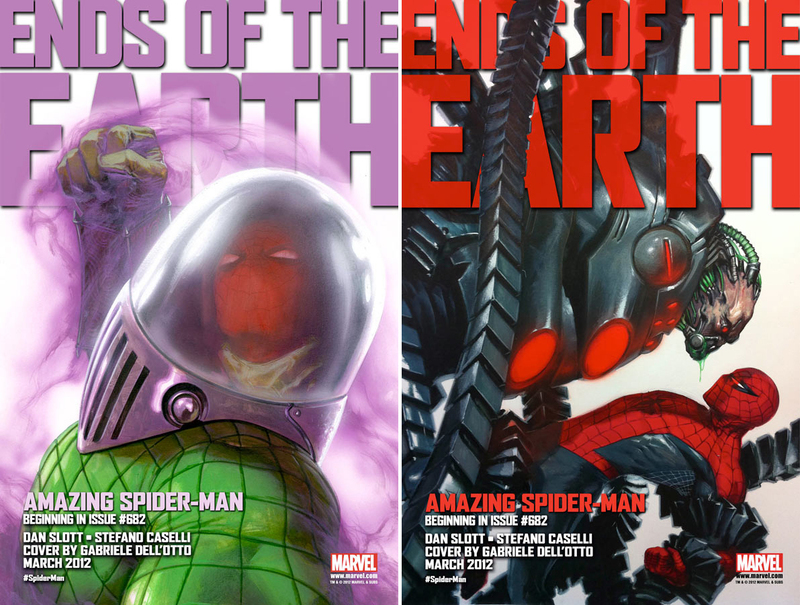 Now armed with the allies to finish the job (namely Mysterio, Rhino, Sandman, Electro and The Chameleon), the storyline which ties into Spider-Man's 50th birthday celebrations will also see "Earth's Mightiest" step into the fray. Hopefully that doesn't just stop at just Pete's current team-mates on the Fantastic Four and Avengers, but also reaches out to some of his amazing friends. I mean who doesn't want to see Deathlok in on this? Kicking off in March's Amazing Spider-Man #682, with writer Dan Slott and defining Spidey artist Stefano Caselli, the only thing sinister about this story-arc (apart from Otto's master-plan that is) would be to leave these bad boys on the shelf - look out for them! so who's the villain in frame 2? Is that Doc Ock? What the hell happened to him if it is? he is dyeing, out of colacteral effects of his experiencies. Now he seems like a cocoon with metal legs and is more scary. And angry. 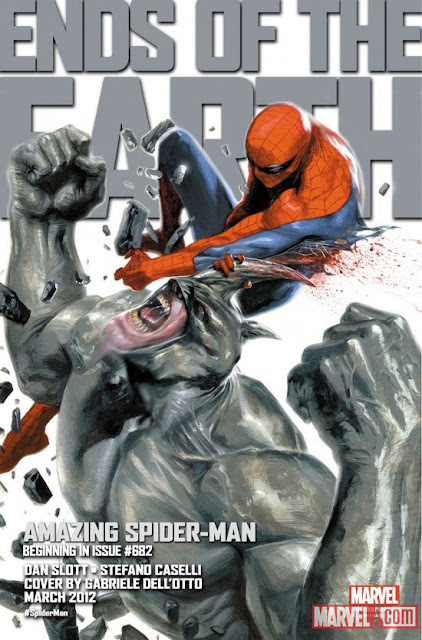 These covers seem like a "lets see who beats the crap aout of Spider-man, better" contest. Sure is Craig - good-bye suit and bowl haircut, hello matrix! The new Doctor Octopus is just as Aliera said, and this storyline is meant to place him at the level of hierarchy he deserves in the Marvel U so you know it's going to be big! As for your contest idea Aliera, that's why I think he needs to call on Cloak and Dagger, Black Cat, Firestar, The Human Torch and other of his amazing friends. I mean strength in numbers right?